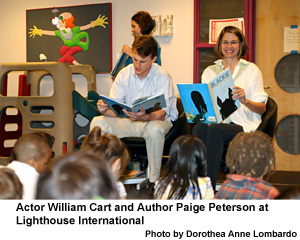 In New York City, on July 17th, 2008, acclaimed artist and author Paige Peterson read from her celebrated children's book Blackie, the Horse Who Stood Still to 50 sighted and visually impaired 3- and 4-year-olds in Lighthouse International's Child Development Center. The children listened attentively and curiously as Ms. Peterson and actor William Cart read the story of Blackie the horse. Paige Peterson co-wrote and illustrated Blackie, the Horse Who Stood Still in 2006 with author Christopher Cerf. The book follows the primarily true story of a beloved horse that stood still for the last twenty-eight years of his forty year life. Blackie was considered the town symbol of Tiburon, CA and was also a part of Peterson's childhood until the horse died in 1966. Following the reading, the students had the opportunity to participate in a question and answer session with Peterson regarding the book. Peterson's reading of the touching story of Blackie was a memorable experience for the youngsters at Lighthouse's Child Development Center preschool.